Don’t go with one of the out-of-town companies or someone without a physical location. Go with the Las Vegas local Pros - we are here for you. 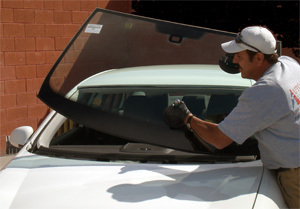 Auto Glass Authority is a locally owned and managed company that offers convenient and professional auto glass repair and replacement service throughout the Las Vegas valley. AGA was founded by Mike Fox and he has been involved in the auto glass industry since 1975. Mike has an extensive resume of running quality oriented glass replacement and repair companies. The company has four convenient, Las Vegas Valley shop locations for while-you-wait service, and a fleet of professionally equipped service vehicles to repair or replace your glass on site. AGA is approved and recommended by most insurance companies and many of Las Vegas finest car dealerships. In addition, AGA stocks original equipment glass for same-day delivery. At AGA we say “experience the difference” - we believe in “delivering the difference”. What that means is that every car is treated to a 12-point check list that guarantees the windshield repair or replacement is done safe, on time, clean, and to exacting standards. For Convenience, Quality, Service, and Value: Experience the difference at Auto Glass Authority in the Las Vegas Valley.